DANIEL SCHÁVELZON, La Conservación del Patrimonio Cultural en América Latina. Restauración de edificios prehispánicos en Mesoamérica: 1750-1980, Universidad de Buenos Aires, Facultad de Arquitectura, Diseño y Urbanismo, Instituto de Arte Americano e Investigaciones Estéticas ‘Mario J. Buschiazzo’ (1990), 270 pp, illus., $35.00, no ISBN. It is a feature of the arrogance of the ‘heritage industry’ of the late twentieth century that it claims to have invented the concept of heritage protection and conservation for itself. There is a patronizing nod towards the work of state antiquities organizations over the past century, but in the eyes of their instigators and proprietors today’s ‘heritage centres’ and ‘heritage theme parks’ in Europe and North America represent a new (and often prof­itable) approach to the past. There is all too little documentation of the history of what has come in recent years to be known as archaeological heritage manage­ment. and what there is tends to concentrate on Europe and the United States of America. The importance of archaeological heritage conservation elsewhere in the world, particu­larly in the more recent nation-states that have emerged from colonialism during the past half-century, has received little attention. Yet the examples of India and Zimbabwe, to cite two among many, testify to the potent role of the archaeological heritage in the establishment and reinforcement of cultural identity. The rich pre-Columbian archaeological remains of Latin America have exercised a particular fascination for the former Spanish and Portuguese colonies south of the Rio Grande del Norte. It is no coincidence that legislation to protect archaeological sites and monuments formed part of the founding con­stitutions of many of the countries of Latin America. In Peru, for example, the first law to protect the new country’s monuments was passed in 1822, within months of the declara­tion of Peruvian independence: it was decreed that ‘the surviving monuments of Peruvian antiquity’ belonged henceforth to the nation. This new approach to the remains of the past as being of national significance contrasted with what had pone before. The infamous ‘Royal Fifth’ established by Charles V of Spain had been a licence for looting, provided that one-fifth of the gold and silver recovered was handed over to the Crown. The later eighteenth century saw a more enlightened attitude towards archaeological sites and objects, as befitted ‘le Siécle des Lumières’. but this was essentially a detached, academic study, lacking any sense of identification or continuity. In this remarkable book, Daniel Schávelzon traces this evolution of attitudes towards the past in Latin America from the later colonial period to the present day, choosing his examples principally from Belize. Guatemala. Honduras and Mexico (it is to be hoped that he. or another, will one day turn to the Andean countries and describe how experience in Bolivia, Peru, Ecuador and Colombia com­pares and contrasts with the Latin American countries of Central and North America). Following two introductory chapters on pre­Hispanic attitudes to the past and the high colonial period (1520-1750), he divides the subsequent history of conservation in Latin America into a series of phases, each of which is the subject of a chapter. The period 1750­-1822 saw the establishment of a conservation ideology, followed by the patriotic movement of early liberalism following independence from Spanish colonial role (1825-50). The period 1850 to 1885 witnessed the birth of scientific investigation, which encouraged the introduction of systematic restoration of major monuments (1855-1911). The pillaging of archaeological sites in the nineteenth cen­tury for the antiquities market (a phenomenon with which the twentieth century is all too familiar and I whose contemporary manifesta­tions are the subject of a later chapter) merits a separate chapter before the author goes on to describe the extreme nationalist approach of the period 1911-30 in Mexico. 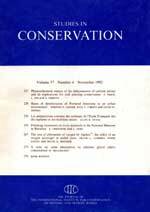 A separate chapter is devoted to the great classic Maya site of Chichén Itzá, which serves as a paradigm for evolving, often con­tradictory, approaches to conservation in Latin America, before the author moves on to the penultimate phase of his study, that of institutionalized conservation and the hege­mony of state antiquities services (1929-50). The remaining chapters are devoted to the continuing debate on the ethics and realities of restoration and conservation, against the background of such doctrinal documents as the 1964 Venice Charter. The final chapter, entitled ‘Hacia un modelo teórico para la conservación del patrimonio cultural’ [Towards a theoretical model for the conservation of the cultural heritage], is a masterly summary of the social and cultural role of the archaeological heritage in the modem world, based largely on Mexican experience. Schávelzon lays great stress on the political significance of the heritage: in his concluding paragraph he is emphatic that ‘the conservation of the cultural heritage is not a non-political fact, independent of the reality that surrounds it. On the contrary, it is a deeply political fact, with the reservation that it may be socially advantageous or profoundly negative’. This is a message that needs to be promulgated widely in those more ‘developed’ countries of the world where the heritage is fast disappearing in the name of ‘progress’ or the ‘market economy’ precisely because its social and political significance is unrecog­nized or deliberately ignored.